Rowe-DeArmond produced over 170 different guitar and bass pickups. The numbered pickups are clearly identified as such in their catalogs. The unnumbered pickups were supplied to CMI/Harmony, Fender, Rickenbacker, Kustom, CF Martin, Standel, Guild, Epiphone and many other companies. DeArmond’s numbers for these items have not been disclosed publicly. Some end-sellers, such as Silvertone, gave a number of these items, including the single and twin-Hershey Bar pickups, different numbers in their own catalogs. Where known, those numbers are shown below. All of the unnumbered pickups as currently known, are shown below. Where they are known to have been factory-fitted in a particular instrument, that instrument will be listed below and the instrument itself will be shown under the manufacturer’s name in the ‘DeArmond Pickups as Installed’ page on this website. Recessed version of DeArmond Model 210 (4 No.) and others. The pickups are also classified by instrument producer, such as Fender (8 No.) and Kustom (7 No.). 1. Single pickup with integral bezel in single-cutaway Harmony H22 Bass (1961-1968) and twin-cutaway H22/1 Bass (1969-1972). 2. Two pickups in 1969 Micro-Frets Rendezvous Bass. 3. Two pickups in Barclay Bass. These are a soapbar (i.e. no bezel) version of the pickup in the Harmony H22 and H22/1 Basses. 4. Two of these single-coil, eight-pole pickups were fitted in the Harmony H27 bass (1966-1971) and H420 Bass. Both pickups are the same height. (1972-1973). 5. Two ‘Four-Vee’ pickups in a 1972 Harmony H-426 Silhouette Bass (1972-1973). Also fitted in Harmony H-425 bass (1975), (B0443). 6. Model 41 ‘No Name’ in EKO Rokes Bass 1966 (A0109). 7. 6-pole guitar pickup factory-fitted in Harmony Bass H25, 1966-1971 (Photo copyright Estate of Francois Demont). 1. Harmony Sovereign guitar Model 655, from 1973. The two height adjustment screws inline with the poles identify this as a DeArmond pickup (B0551). 1. Chrome bar pickup, plain, surface-mounting, woodscrew-fixed to guitar body directly or through timber base. 2. Chrome, plain, semi-recessed, rivet-fixed to pickguard. 2. Another view of above pickup, showing the two fixing tabs. 3. Chrome, with central, raised, dimpled panel, rivet-fixed (Alden, Harmony). 4. Chrome, with added red top panel, rivet-fixed. Pickup unique to Harlin Bros. Hawaiian Guitar. 5. A Bar pickup with a riveted bezel in a Guild Freshman guitar. This pickup has not been seen on any other instrument. 7. A variation on Model 40 with shortened side-tabs, riveted to a pickguard in a Harmony guitar. 8. Pickup riveted to pickguard in a Regal H265 guitar. This pickup has not been seen on any other instrument to date (B0222). 1. A basic single Bar pickup assembly, branded Silvertone, with V and T controls. The complete assembly is held in position by two prongs on the lower side, located at the bridge and two spring-loaded pins on the upper side, located at the neck. This unit has also been seen branded Lectrolab, Chicago. This unit is in Silvertone’s catalogs with different model numbers in successive years – as model 1399 and 1440. The V and T pots in the single and twin pickup versions of this unit were Centralab manufacture as used in DeArmond pickups Models 700, 750-C and 800. 2. A twin Bar pickup assembly, branded Silvertone, with two V, two T controls and one pickup selector switch. The complete assembly is secured in a similar manner to the single pickup version shown above. This unit is in Silvertone’s catalogs with different model numbers in successive years – as model G 1398 and 1441. 3. For installation in flat-top, roundhole guitar. The V and T pots and capacitor are seen located beneath the top plate, as viewed from below. The pickup itself is by DeArmond. Some examples are branded ‘Lectrolab”. Two tabs (top of lower photo) are positioned under the rim of the soundhole and the lower screwfixed tab secures the pickup in place. 4. Soapbar with integral chrome bezel in two slightly different widths and several different height options, achieved by forming dimples in the bezel. 1. Soapbar, chrome, with gold infill, rivet-fixed. 2. Chrome, in white bezel with gold infill. Bezel screwfixed. Pickup is surface-mounted. The numbers 6811 or 6812 are stamped on the underside of some examples. 3. Chrome, integral bezel with risers, gold infill. 4. Chrome, with integral bezel with white infill, in Regal R-273 twin-pickup archtop. Bezel woodscrew-fixed. 1. Two-scroll ‘Maximum’ pickup with adjustable pole-pieces in Harmony ‘Roy Smeck’ guitar. 2. Two-scroll ‘Maximum’ pickup without pole-pieces. 1. S-grille pickup with gold infill, in black plastic bezel, as installed in Harmony Mandolin H35. 1. Chrome soapbar, silver infill, woodscrew-fixed through timber bezel into Harmony archtop guitar body. 2. Chrome pickup with riveted chrome base in 1967 Messenger guitar. Base is dimpled to increase pickup height at bridge. Woodscrew-fixed through timber bezel into archtop guitar body. 3. Chrome pickup, silver infill, with riveted chrome base. Note the bigger chrome bezel, which was fitted to some DeArmond pickups. 1. Chrome, with multi-diamond cut-out pattern on top, black infill, rivet-fixed. 2. Chrome, with multi-diamond cut-out pattern on top, white infill, woodscrew-fixed through timber base shown. 3. Multi-diamond bridge pickup in chrome with integral flat bezel and black infill timber base, in Airline 6448 archtop guitar. 1 & 2. Recessed Neck and Bridge versions of DeArmond’s attachable guitar pickup with chrome housing and white coil former. 1 & 2. Recessed Neck and Bridge versions of DeArmond’s attachable guitar pickup with chrome housing and white coil former. The coil former has the same cambered front and chamfered sides as the Model 210. 3 & 4. Recessed Neck and Bridge versions of DeArmond’s attachable guitar pickup with chrome housing and black coil former. The lower photo shows the pole-pieces with their threaded plastic oversleeves, screwed in through the pickup’s bottom plate. 1. This pickup, embossed with the ‘Emmons’ logo was fitted in some lap steel guitars produced by Emmons Guitars of Burlington, North Carolina from 1967 to 1972. The pickup is similar in appearance to the Model 41 guitar pickup, but is larger, measuring 4.1″ x 1.55″ ( 10.4 x 4.95mm.). The pickup shown has a DC resistance of 5K7 Ω. 1. Chrome, attachable, with individually adjustable pole-pieces, for flat-top guitars. 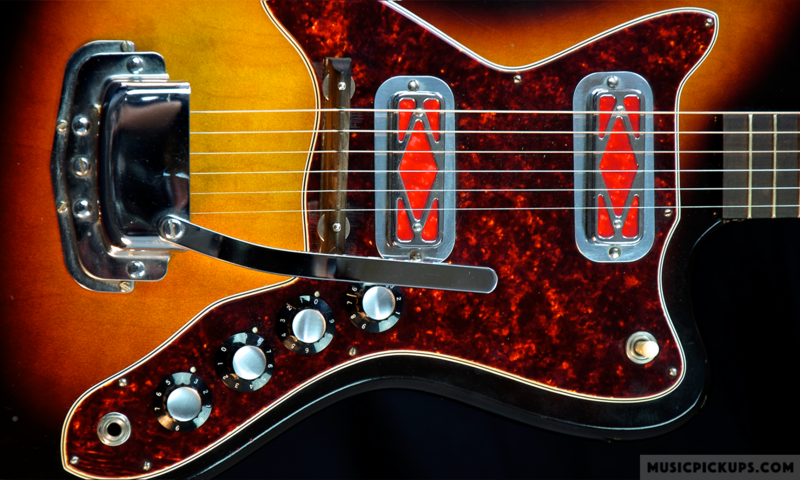 Based on the bar pickup, it was designed to fit in Fender’s flat-top acoustic guitars which had a circular profile steel rod running below and parallel to the strings. The slots for the edgewise V and T controls are visible at each end of the pickup. The second photo shows the underside of the pickup with the two slots for the V and T pots, the long slot for the fixing bracket and the LH end of the coil assembly. It is not yet clear whether this pickup was marketed. 2. This pickup was marketed by Fender as their Model FP-6, with the V and T controls outside the metalwork. 3 & 4. A set of all-chrome Coronado Guitar pickups. These pickups’ poles are slotted setscrews and do not require a recess in the instrument. They are basic bar pickups. The bridge pickup view at top shows the riser indents. 5 & 6. A set of ‘Black Tee’ Coronado Guitar pickups. These pickups’ poles are individual pin magnets with plastic threaded oversleeves and require a recess in the instrument.